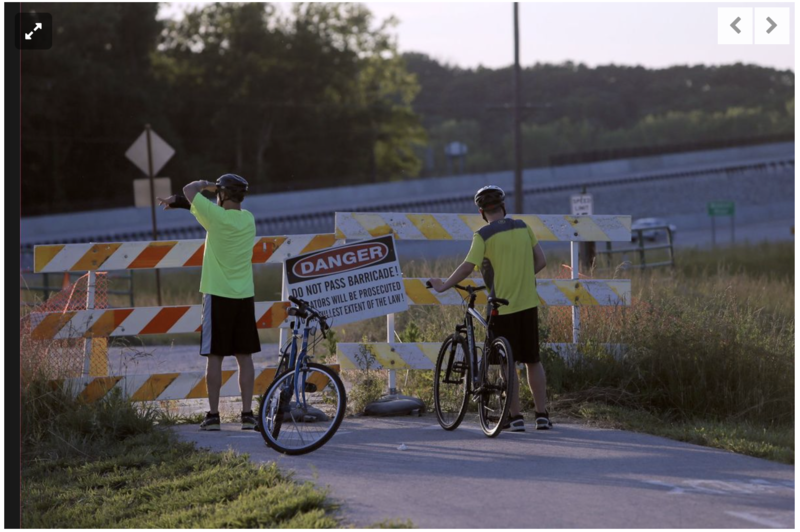 CHESTERFIELD • Bikers and walkers now have another path across the Missouri River. The Daniel Boone Missouri River Bridge bike path opens Thursday, giving those on two feet as well as two wheels a protected lane along Interstate 64, and connecting St. Louis and St. Charles counties. This is the third Missouri River crossing in the St. Louis area. The Page Avenue Bridge has a dedicated bike path, while bikers on Discovery Bridge at Highway 370 are able to ride on the shoulder. The new bridge path connects the Monarch Levee Trail in St. Louis County to the Katy Trail in St. Charles County. Klues hopes having more access to new communities will help riders and walkers alike “get to know their regional neighbors.” While someone in a car might not stop to help a fellow driver on the side of the road, on a trail, bikers and walkers are more likely to interact with each other. Having easy access to other towns without having to get in a car also connects pedestrians to businesses, Klues said. “It’s kind of like turning a mountain into a ski resort,” said Mike Weiss, owner of Big Shark Bicycle Company. In 2012, Weiss took over a bike shop in Chesterfield. While his shop had easy access to the Monarch Levee Trail, he was still left with a dilemma — in such a car-centric shopping center, he had a trail, but the trail didn’t really go anywhere. On the opposite side of the river, Robin White said, most businesses along the Katy Trail have grown accustomed to having cyclists stop in while on a ride. White and her husband own Katy Bike Rental and Robin’s Nest in Defiance, Mo. As for bikers concerned about walking into a winery after a sweaty bike ride? Don’t worry about it, White said. Having a crossing dedicated to bikers and pedestrians also gives riders and walkers peace of mind when riding along a major interstate, Klues said. 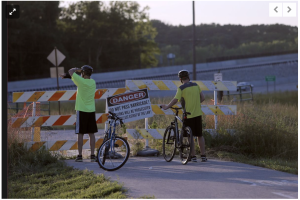 The Monarch Levee Trail has been partially closed since 2013 because of bridge construction. The full trail will open Thursday along with the bridge. The Chesterfield Parks and Recreation Department plans to host an official ribbon-cutting ceremony at 9 a.m. on June 18 at the northwest parking lot of the St. Louis Premium Outlet.